We are providing you one liner GK Questions And answer for uttarakhand PCS pre exam 2016. uttrakhand pcs Exam is expected to held on December . So here are 30 one Liner Gk Question and answer PDF . 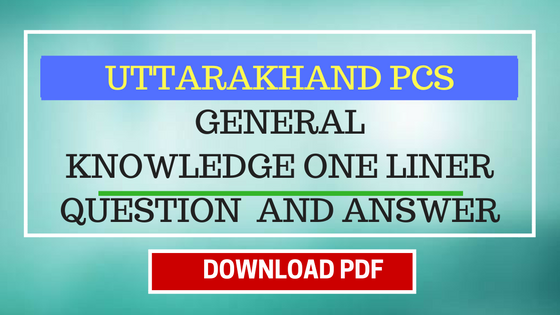 you can download the GK Question PDF Next 30 important question will be post soon for you. 1. Which energy do not have the problem of pollution? 2. When was the Madras State renamed Tamil Nadu? 3. What is a suitable unit for expressing electric field strength? 4. Rotation of the earth causes deflection of wind by which force? 7. What is the name of the person that controls a football match? 8. Which air pollutant affect the nervous system of man? 9. Which is the chief characteristics of wet and dry tropics? 10. By whom was Shuddhi movement (conversion of non-Hindus to Hinduism) started? 11. Which Union Territory attained statehood in February, 1987? 12. Which oxyacid of halogen has maximum acidic nature? 13. From when was the Zero Base Budgeting in India first experimented? 14. What is most important reason for dwindling forest resources today? this said by Sir Hugh Rose? 16. Who is the leading wicket taker in the history of Test cricket? 17. The greatest threat to organisms and biodiversity in which process? 18. Which Article of the Constitution of India makes a specific mention of Village Panchayats? 19. How much of earth surface is covered by the forests? 20. Who was the first Indian woman President of the Indian National Congress? 21. The unidirectional property of a pn-junction is useful for its use as which thing? 22. Who has been awarded the Prem Bhatia Award for the year 2012? 23. Who is the chairman of 13th Finance Commission? 24. The Himalyas are approximately how many kilometer broad? 26. Which animals have a diet mainly consisting of bamboo? 27. Which Amendment of the Constitution of India deals with the issue of strengthening of the Panchayati Raj? 28. Thermal decomposition of alkanes is known as which name? 29. How many islands of India are located in the Bay of Bengal? 30. In ancient India, at where was the earliest capital of Magadha kingdom?